Kiera Grace oversized 23 inch wall clock in antique copper and gold trim has evolved from merely being functional timepiece devices to wall dicor products with a secondary time keeping function. Strict quality control at production: we check all the movements individually to make sure they function properly at the factory before assembling clocks. Our Expression wall panels were designed as an allegory to the spirit of the world's most beautiful cities. The refined lines and rich tints enhance the unique look of any decor. Whether you choose the Chevron, Boston, Denver, Quibec, Montrial, Toronto, Anchorage or Seattle from our Expression wall panel choices, you'll LOVE the destination! Our Expression wall panels were designed as an allegory to the spirit of the world's most beautiful cities. The refined lines and rich tints enhance the unique look of any decor. Whether you choose Boston, Denver, Quibec, Montrial, Toronto, Anchorage or Seattle from our Expression wall panel choices, you'll LOVE the destination! Kaleidoscope has the wow factor. Created in the Graham & Brown studio, this large metal design was inspired by the geometric patterns in our wallpaper. Beautifully finished in a gold metallic, Kaleidoscope is perfect for adding depth and dimension to your walls. Hang vertically, horizontally or even diagonally to fit your space. Oversized 23 Inch. Wall Clock With Raised Roman Numerals In Antique Copper Finish And Gold Trim Kiera Grace oversized 23 inch wall clock in antique copper and gold trim has evolved from merely being functional timepiece devices to wall dicor products with a secondary time keeping function. Strict quality control at production: we check all the movements individually to make sure they function properly at the factory before assembling clocks. Oversized 23 Inch. 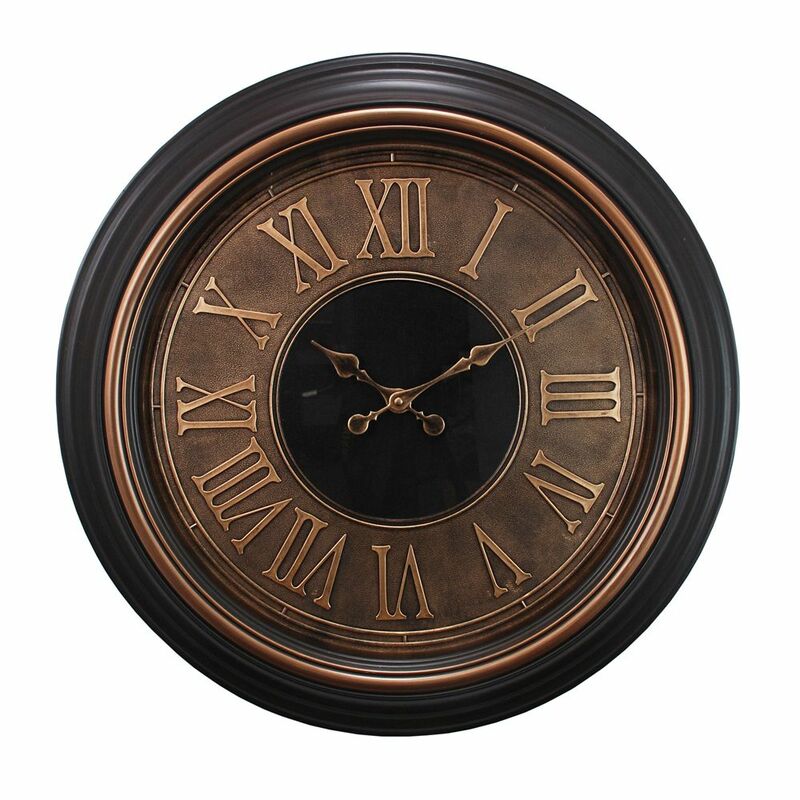 Wall Clock With Raised Roman Numerals In Antique Copper Finish And Gold Trim is rated 4.6 out of 5 by 7. Rated 5 out of 5 by HomeDepotCustomer from very nice looking and big to see numbers.... very nice looking and big to see numbers. Rated 4 out of 5 by Dorothy from I was please with the wall clock.I am now Checking... I was please with the wall clock.I am now Checking for the maintenance I paid for the clock.. Rated 5 out of 5 by Sandyakadaisy from Beautiful clock and centrepiece to our wall! Bought this a few weeks ago and it came promptly and secure by courier. Lovely colour and is exactly as represented in the photo. Love it! Rated 5 out of 5 by jmcjecfl from Absolutely love this huge, attractive wall clock! It far exceeds any expectations I might have ha... Absolutely love this huge, attractive wall clock! It far exceeds any expectations I might have had for how it would look in our living room. Do be sure to measure where you plan to hang it-even though the description said "oversized and 23" we did not realize how big it really is. We hung it over a 46" flat screen TV instead of next to a fireplace with less wall space-and it looks perfect! Would never have thought that Home Depot online had such stylish choices for decor. Very pleased! Rated 5 out of 5 by gin1234 from Looks and works great. We are very pleased with this purchase.Would recommend this product to any buyer. Rated 3 out of 5 by PBn from The clock is attractive and keeps time efficiently. However you can't see the numbers except in... The clock is attractive and keeps time efficiently. However you can't see the numbers except in bright daylight. Defeats the purpose of having a big clock. Rated 5 out of 5 by Anonymous from Beautiful. Very pleased! Lovely and classic. Makes a very bold statement. Traditional in its approach but not too stately. Very easy to read. Perfectly matches our decor. Does this clock make a ticking noise every second? This clock will make a light ticking sound, as it is not a silent clock. Can this clock be used outdoors? The clock is intended for indoor use only. That being said, as long as it is not exposed to rain and extreme weather, it should be fine on a porch or balcony, for example.